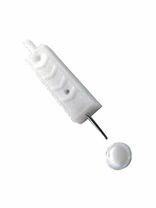 Box of 100 sterile, single-use neurological examination pins which avoid the risk of cross-infection and skin puncture. Deisgned for use with the VibraTip. 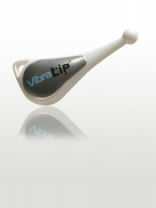 The VibraClip includes a specially designed magnet which fits snugly into the loop of the Vibratip. This allows an easy connection to the clip on the lanyard, allowing effortless and continuous one handed use and docking of the instrument. 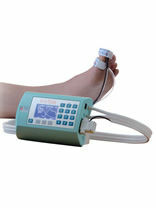 A new device using standardised vibration for detection of peripheral neuropathy. 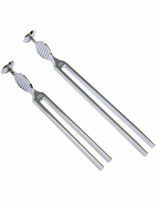 VibraTip has been specifically designed to overcome the limitations of tuning forks for testing the integrity of vibration sense. With sufficient battery life for several months of routine use, VibraTip is easily wiped clean and small enough to be concealed in the hand. Its silent switch and quiet operation minimizes cueing and its rounded head allows vibration sense to be assessed specifically and rapidly from almost any angle. 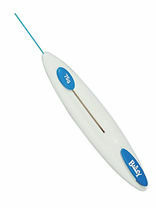 The retractable monofilament is an ergonomically designed diagnostic tool for detecting sensory neuropathy e.g. in diabetics. 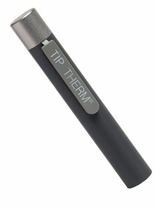 Tip Therm is an early diagnostic device for symmetrical polyneuropathy which measures temperature sensitivity of the skin. 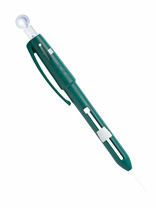 It was developed to give the clinician and patient a convenient and easy to use method of testing. A fully automated system for assessment and diagnosis of peripheral arterial disease and critical limb ischemia. 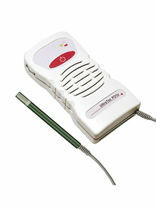 Advantageous for follow ups of diabetic patients, patients with chronic renal failure and elderly patients. 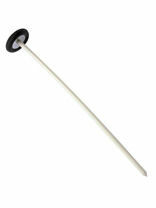 Also a useful assessment tool for the healing potential of ulcers.